Okay people, we had our first 70-degree day yesterday and it looks like warmer, more seasonal temps might actually be here to stay. :: sky opens up and the angels start singing from above :: Hallejuiah! I have never been more ready and excited to get my outdoor entertaining spaces whipped into shape. It's been a long winter and they could use a little TLC at this point. One of my favorite ways to jazz up an outdoor space is with indoor/outdoor rugs. They're easy to switch out and come in so many different colors and patterns...perfect for infusing your space with a little fun. Here's a few of my current faves and how I use them! Oftentimes, areas that lead to porches and patios get a lot of traffic and are main throughways in our homes. So why not use indoor/outdoor rugs to bridge these spaces and create a sense of consistency? Our back porch houses the grill and outdoor table, so that's where we do the majority of our outdoor dining. This space is directly off of our mudroom and back hallway, which gets a ton of foot traffic. So I use the Geneve Indoor/Outdoor rug collection from Ballard Designs in both of these spaces. I chose the silver color -- I have runners in my mudroom and hallway and a doormat on the porch. Using the same pattern/color creates continuity between these two spaces. Plus, they're so easy to keep clean...I literally hose them off every so often and they look brand new! Outdoor rugs have come a long way in terms of style and quality over the last few years (at least in my humble opinion)! There are so many options that are built to withstand the elements, but that also incorporate beautiful patterns and features that are more reminiscent of your favorite indoor rug. For example, this Lexington Gray Rug from McGee & Co. is woven with thicker yarn to give it that chunky, cozy look. I also love the fringe on Pottery Barn's Beverly Synthetic Rug. Paired with the Moroccan tile motif, it gives this rug a fun, global flair. Whether it's inside or outside, I love to layer rugs. I think it adds instant depth and interest to a space. My front porch has a weird, very wide step right outside the door before you step down onto the porch...not my favorite feature, but it's there and there's nothing we can do about it now (basically my husband's motto)! I used to just have a regular door mat there, but it made the entry feel so small and that weird step feel so much bigger. So I started layering a rug underneath my doormat. 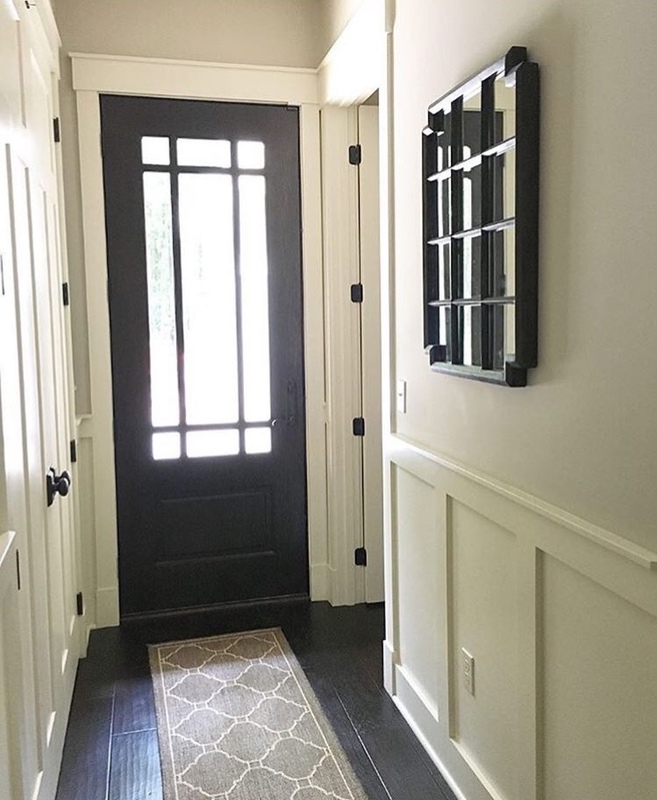 It not only makes the entry look more inviting, but it also makes that weirdo step look like it plays an actual role in the decor! Don't hide it...give it a job, right? I just bought this Dark Brown Striped Outdoor Rug from Target to layer underneath my rug for the spring/summer months. But if you're looking for something a little more modern and edgy, check out this option from IKEA...you can't beat the price! I also love the idea of layering rugs to better define a space. For example, I have a cute little cafe table and two chairs on my side porch. I put a larger area rug down and then put a small round rug on top of it. The round rug is perfect for setting the table on and the chairs stay on the larger area rug. This adds some structure to this corner and makes it the perfect little nook for enjoying your morning coffee. 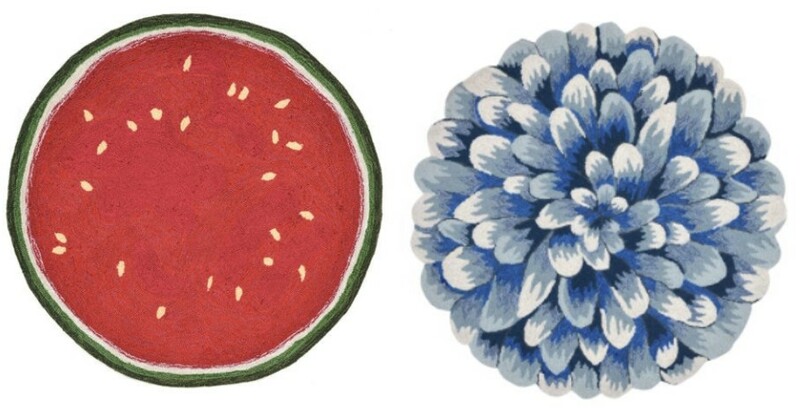 I'm in love with these Watermelon Slicer and Blue Mum Rugs from Pier 1...I mean, talk about summer fun! Depending on the size and orientation of your porch, a 3x5" indoor/outdoor rug usually works for layering under a doormat. But if you have a weird step like I do, don't be afraid to cut an outdoor rug for a custom fit! Now obviously, there's a couple of things you should consider before you start cutting up a brand new rug. A) maybe don't go out and spend hundreds of dollars on one just to slice and dice it. B) the rug you pick should be thinner (for the sake of your sanity) and should have a uniform pattern. 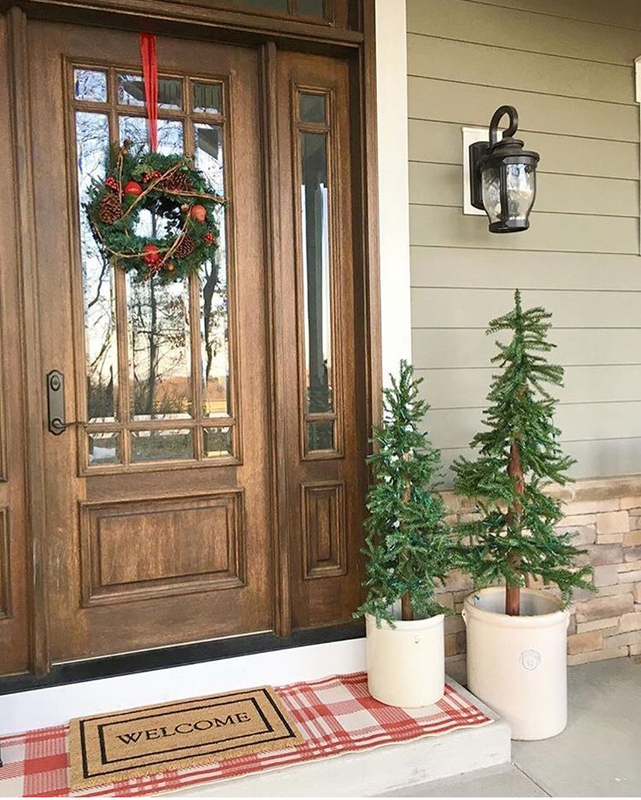 As I was decorating for the holidays this past year, I chose this red plaid outdoor rug from Target (it's sold out now, but they have similar options available). I got the runner size on clearance for a great price. I used heavy shears to cut it down to fit the width of my front porch step and I even had enough left over to cover my side porch step, too! After cutting it, I finished the raw edges with a strip of hot glue just to make sure they didn't start to unravel. This ended up being a great way to get a custom-fit rug with minimal work and cost!